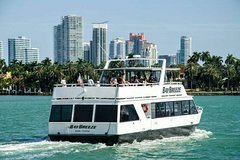 Embark on a 1.5-hour sightseeing cruise departing from Bayside Marketplace in the heart of Downtown Miami and enjoy the view of the famous Miami's Millionaires' Row and the Port Of Miami. Enjoy this 1.5-hour cruise and admire the famous Miami's Millionaires' Row. Visit the Port Of Miami where you will see the cargo ships and Cruise ships along with the growing Downtown Miami Skyline.